In the Southwest, the name Kit Carson is almost synonymous with “fur trapper” or “frontiersman.” This real-life historical figure became the subject of folk lore and legend even in his own time, as he expanded the fur trade and forged new trails across the West during the mid-19th century. 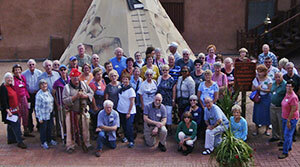 Raised in Missouri in the early 1800s by poor farmers, Carson made his way west to Santa Fe, New Mexico, in 1826. He began fur trapping two years later, moving north and setting up his own base camp in Taos, where visitors can still tour his original home today. Carson’s fur trapping exploits took him across the west, venturing as far as California and as high as the Rocky Mountains. He was even employed for a brief stint at Bent’s Old Fort in La Junta, Colorado, in the early 1840s. In 1842, Carson met John C. Fremont, a topographer on assignment with the U.S. Army to survey the land west of the Mississippi River. The following year, Carson joined Fremont and mountain man Thomas Fitzpatrick on an expedition to the mouth of the Columbia River at the Pacific Coast between present-day Oregon and Washington. The public was captivated by reports of the group’s expedition, elevating the men to national heroes for their brave journey west. Carson continued to serve as Fremont’s guide after the Columbia expedition, furthering his reputation as an intrepid explorer. He also contributed to pivotal events in the country’s western expansion, joining Fremont in the Bear-Flag Revolt against Mexican control in California, and later leading troops from New Mexico to California to quell a Mexican rebellion against U.S. occupation. In the 1850s, Carson began to settle down in New Mexico, drawing upon his family’s farm history to become a successful rancher during the profitable Gold Rush era. When the Civil War engulfed the country, Carson formed New Mexico’s volunteer infantry in support of the Union, which fought against a Confederate advance up the Rio Grande at Valverde in 1862. Although many of Carson’s escapades were celebrated, his involvement in the Navajo “Long Walk” of 1864 is not without scrutiny. Carson’s trapping career had introduced him to many American Indians engaged in the fur trade, and he was deeply integrated with many of the western tribes, eventually wedding an Arapahoe woman as his first wife, and a Cheyenne woman as his second. For this reason, Carson was appointed a federal Indian agent for northern New Mexico in 1853, a post he used to advocate for the protection of native populations from white settlers with the development of Indian reservations. However, Carson’s military assignments during the Civil War soon shifted to retaliating against the Navajo tribe for resisting the government’s efforts to relocate them to a reservation. 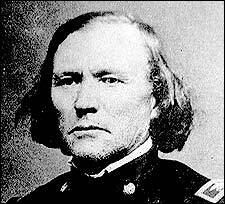 Carson led his troops in a destructive raid through Navajo territory, leaving the Navajo open to attack from rival tribes and forced to surrender in 1864. Under Carson’s command, more than 8,000 Navajo made the 300-mile long walk from present-day Arizona to Fort Sumner, New Mexico, without government aid. Many perished from the route’s extreme conditions or succumbed to illness in Bosque Redondo, the internment camp where they were ultimately relocated. Following the end of the Civil War, Carson relocated to Colorado, continuing to capitalize on his Indian ties. As commander of Fort Garland, he negotiated a peace treaty with the Ute tribe, and spent the early months of 1868 serving as the superintendent of Indian affairs for Colorado Territory. In May of 1868, Carson’s adventures came to an end when he passed away from an aneurism, reportedly uttering the final words, “Doctor, compadre, adios!” (Doctor, friend, goodbye!) Today, many landmarks and cultural features across the southwest bear his name, ensuring the mythology of the storied adventurer lives on.